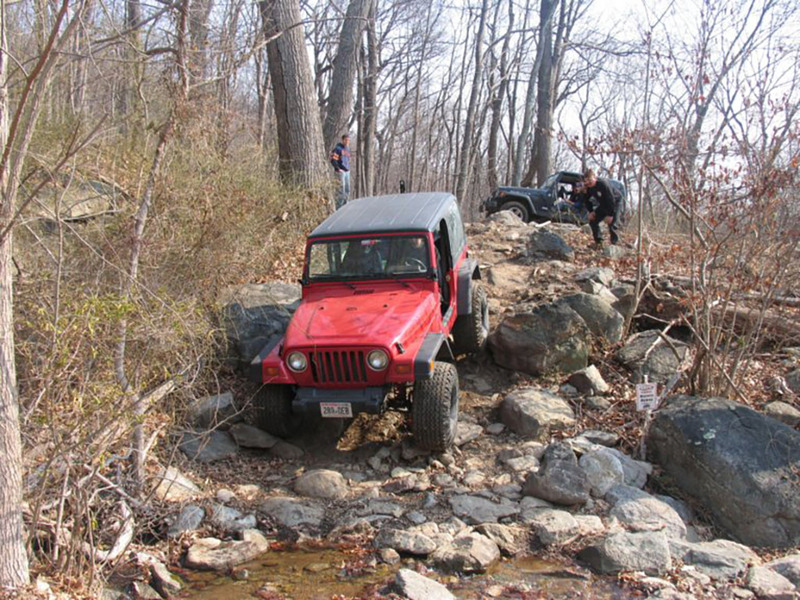 Crozet Run | Capital Off Road Enthusiasts, Inc.
Crozet is known as “What I Broke” wheeling place by some and for others it’s a play ground. Loc Pham (Rubicon), JC Campos and Susan (Samurai), CORE members, and guest Marco Mendoza (Land Rover) headed for Crozet separately on Friday afternoon. Marco and I shared a cabin at Misty Mountain campground. JC and Susan stayed in a hotel in Charlottesville. Saturday morning Marco and I arrived at the staging area early. It’s was a cool morning with a clear sky. The chilly wind made me crave for a cup of hot coffee. I looked around. There was only one tent with one Jeep parked next to it. A lonely night to camp here, I thought. 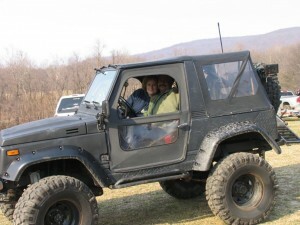 Some Jeeps and off-road buggies owners were busy getting their rigs ready. 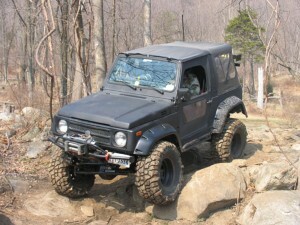 While Marco and I were airing down tires and disconnecting the sway bars, JC showed up in a Samurai with 33″ tires and a 7″ lift. 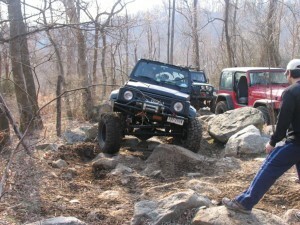 I thought he would bring a Jeep CJ. As much as I was surprised by his car, I was even more surprised when Susan introduced herself as JC’s fiancée! We exchanged brief greetings and introductions. About 30 minutes later, we were ready to hit the trail. I was behind a trail leader who goes by the name H2 RCVRE. 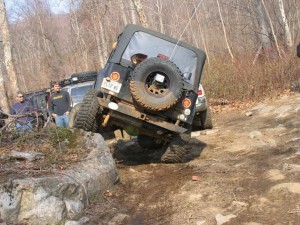 It is also a license plate of his TJ. I decided to follow H2 RCVRE wherever he’d go, “Follow the Leader”. Soon we encountered the first obstacle. 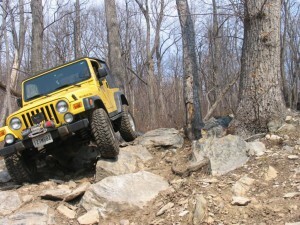 The rocks here were big enough to hit under our rigs easily. I called for a spotter and Diego guided me through successfully and the same for JC. Marco’s Land Rover got hung up at its center. JC offered help. His tiny Samurai pulled a larger Rover out easily. A stock Rubicon had a hard time with getting stuck by big rocks underneath. We pushed, lifted the back end and the driver managed to get through. 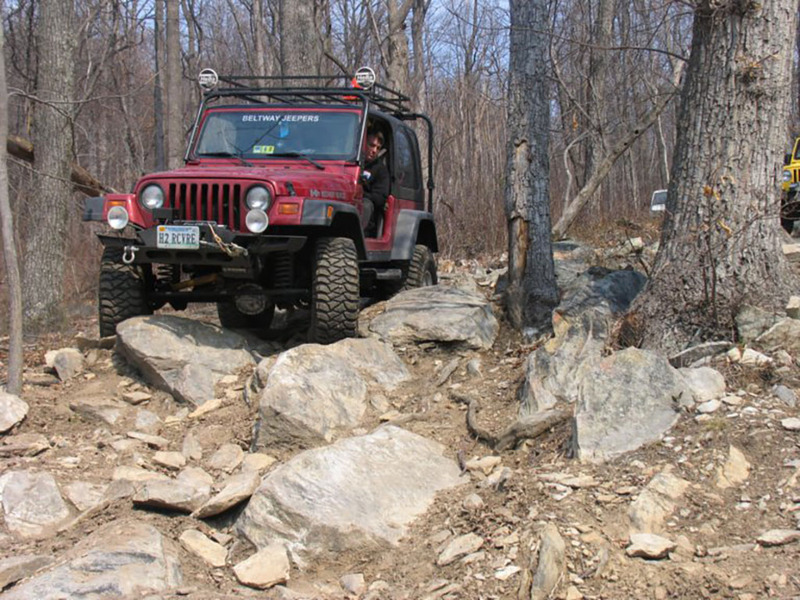 Our next challenge was a small rocky uphill with two big rocks on each side. Either you precisely enter between or put one of your tires over one of them. Once a gain, Diego spotted us through with no problems. 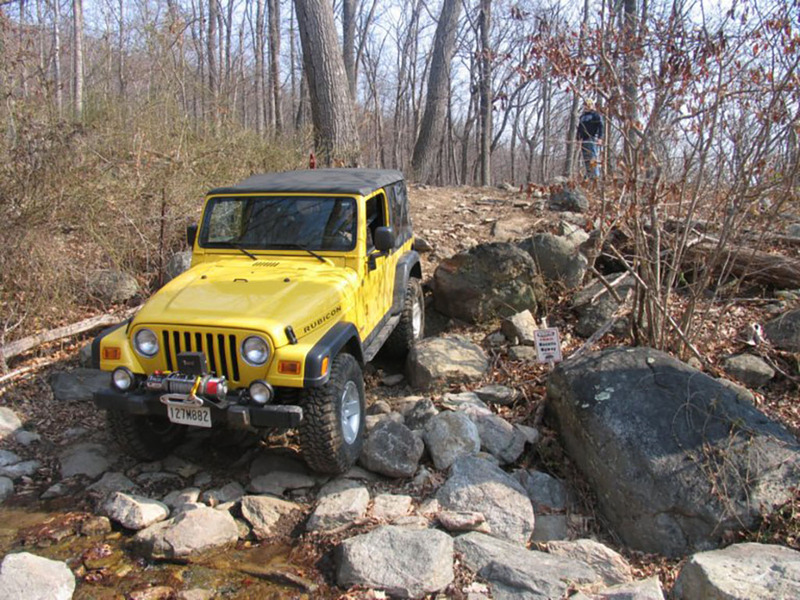 The stock Rubi and a few others took the by pass. 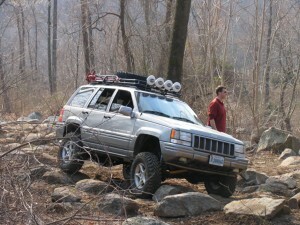 I was impressed with a Grand Cherokee and an Isuzu. 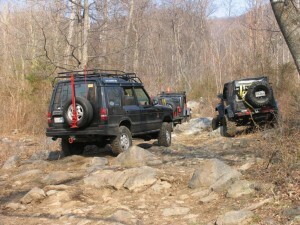 These two rigs were navigated well by their drivers. 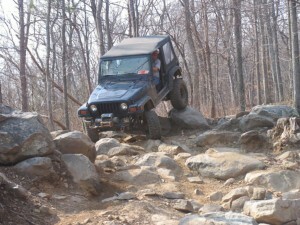 The morning was rolling along on this rocky trail. We were approaching a creek H2 RCVRE called on the CB concerned about a heavy smoke from a vehicle behind me. I looked back. From a short distance, a big cloud of gray smoke came out from JC’s Samurai hood as he was getting through a few rough spots and stopped. JC discovered the oil filter was punched by the steering subsystem inside the engine compartment, and needed to get back to the staging area for repair. But first we all had to go down a slope and cross a creek. Once again Diego spotted those that needed it. I volunteered to go back with JC, but Marco made a decision to go back with JC and went home from there. Marco has received bad news of a close family friend’s death in Bolivia. After JC and Marco left, we re-grouped and took on another rocky hill, went down and came back up on the other side in a loop. Everyone seemed to have more confidence and handle well the second half of this morning. 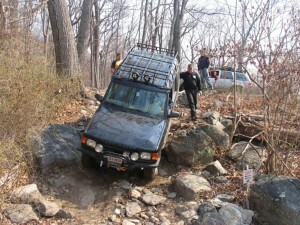 Next we traveled down a hill with a long stretch of muddy ruts. At the bottom of this hill where the trail turns, there was a big rock in the middle between two trees. 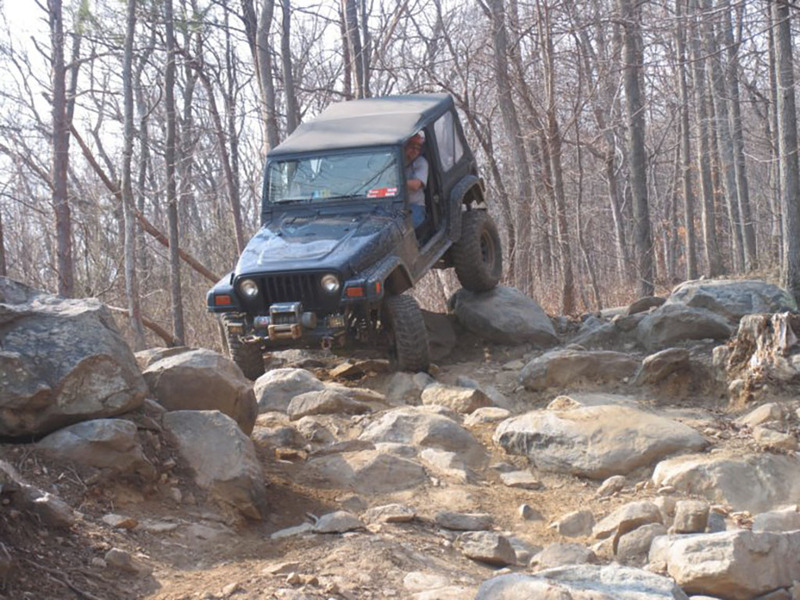 I had some difficulty putting the front passenger tire on this rock. It felt like I was pushing instead of climbing. H2 RCVRE advised me to turn on the rear locker. That’s all it took, up and over! Some chose not to deal with this rock and took the bypass. It was lunch time. We headed back to the staging area. 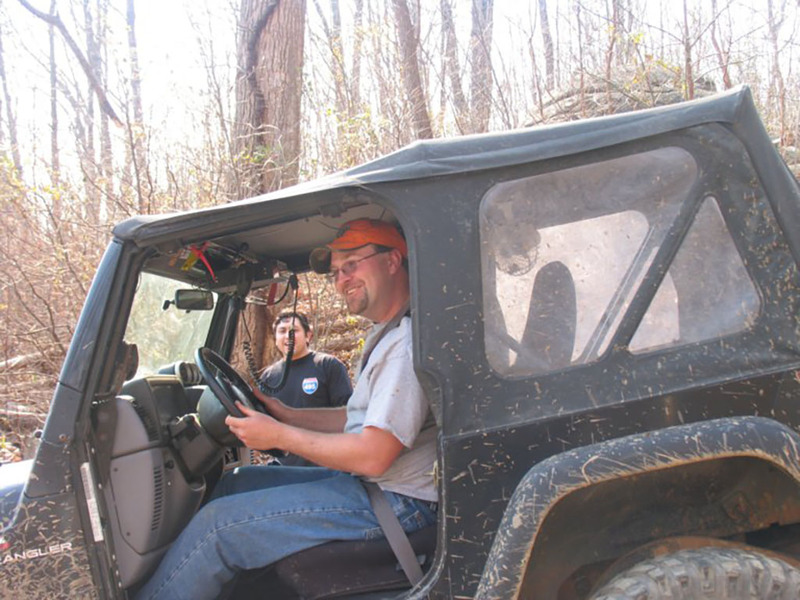 During the time we were out wheeling, JC replaced the oil filter and a broken steering system bolt and joined us after lunch to conquer the rest of the day. In the afternoon, it seemed H2 RCVRE took us on more difficult terrains. 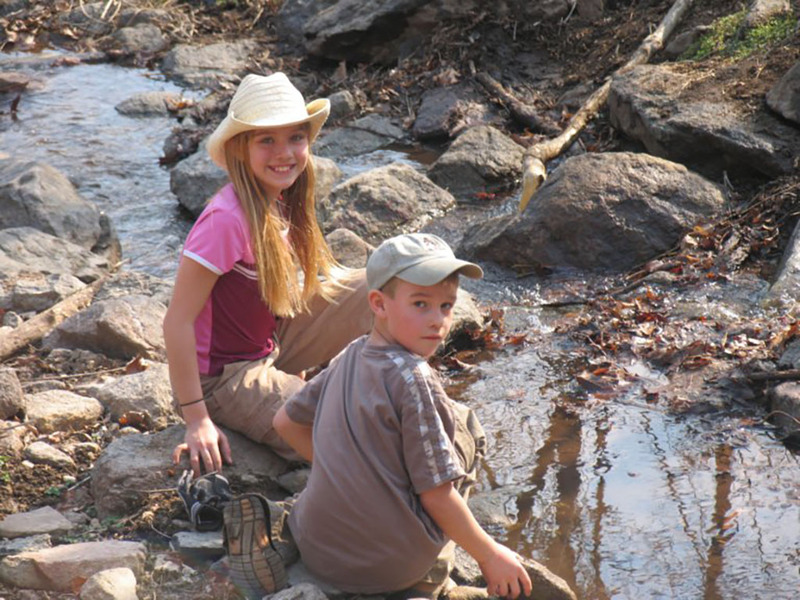 We crossed another creek that had more rocks then water. Next we climbed up a large and very intimidating massive wall of rock. We all made it and continued on. 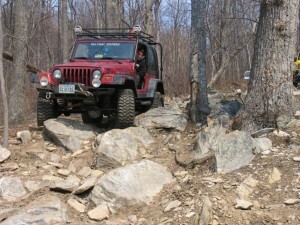 Another part of this trail had rocks sitting in the middle. 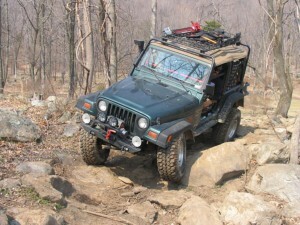 They were big enough to touch and scratch your Jeep rock rail guard and rear bumper if not careful. 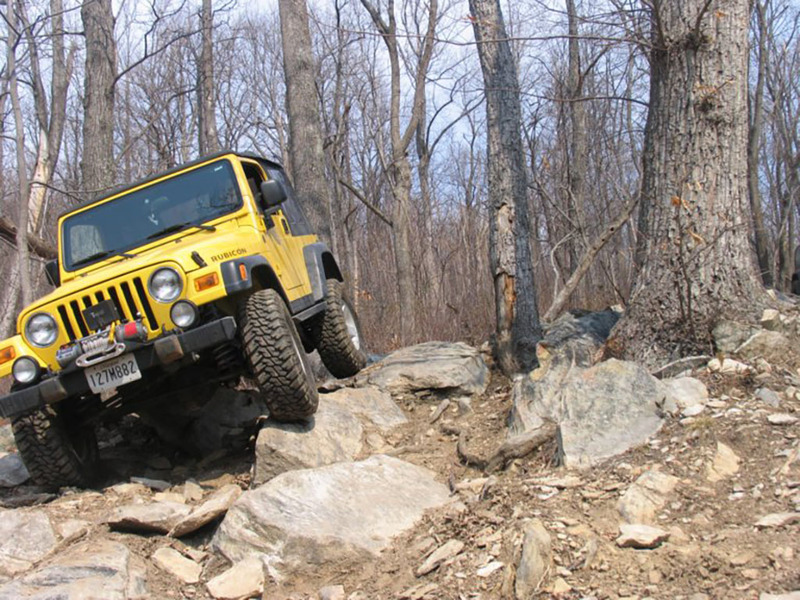 Some decided to avoid them after hearing banging noises caused by rear bumpers that dropped and hit those rocks by leading rigs that climbed on top and over them. The weather now turned out to be nice and the temperature was in the cool low 60s. Everyone was enjoying themselves. 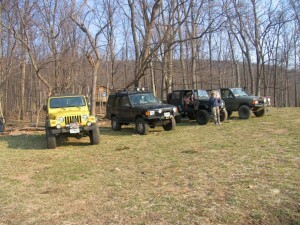 Then we were stopped by two other groups that came up a hill the in opposite direction. We watched them. 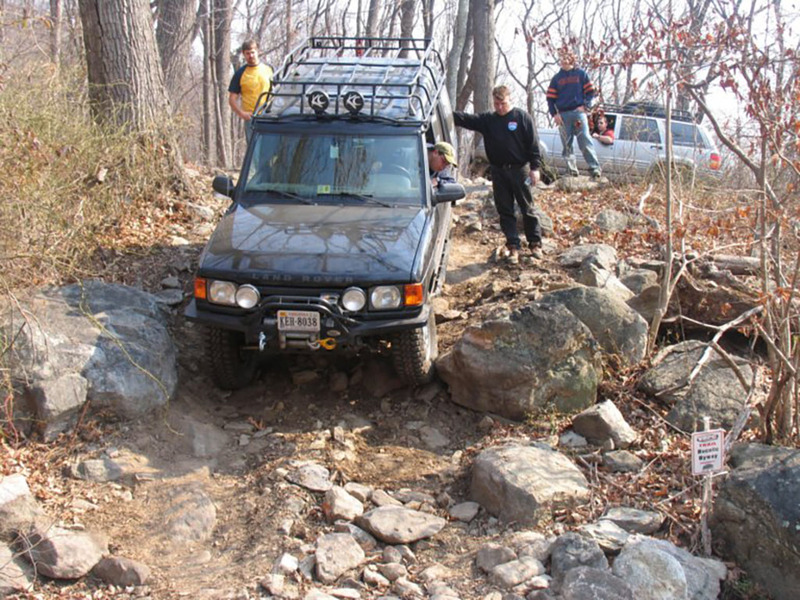 A Jeep Grand Cherokee and a Land Rover with a long base wheel managed to climb over larger rocks and up hill fairly easy. H2 RCVRE decided to come down this hill instead of going around and come up like the other groups. I studied him carefully and picked my line. 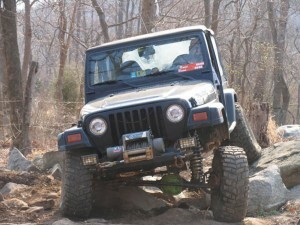 I asked Mike from Beltway Jeepers to spot me. I showed him where on the rocks I wanted my Rubicon’s front and rear tires. I made it down with a sense of accomplishment followed by JC and some others. At the bottom of this hill, we would normally follow another trail by following a creek but the other two groups were still in front of us. H2 RCVRE’s decision was not to wait and to cut across the creek. He struggled climbing over the rocks on the other side of this creek and finally made it with a damage to the passenger side-step and front driver side coil spring that slightly slid off the base. This is the first time all day that H2 RCVRE exerted great effort to get through an obstacle. Now, I’m next and realized that if I couldn’t make it on the first try, I could be in trouble. My plan was first taking a different line on smaller boulders; secondly with a little bit more speed.And Diego was ready to spot me. “That’s one way to do it!” exclaimed Diego. I made it and felt ecstatic. 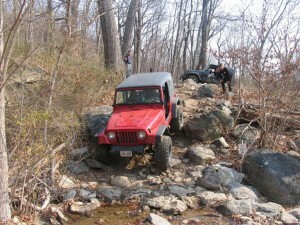 As I celebrated and kept my eyes off the trail, my Rubicon got caught by a rock under the skid plate! No problem Diego put his weight on the rear bumper and I drove out of it. JC and the rest of the group, once again spotted by Diego, one by one conquered this unplanned challenge. 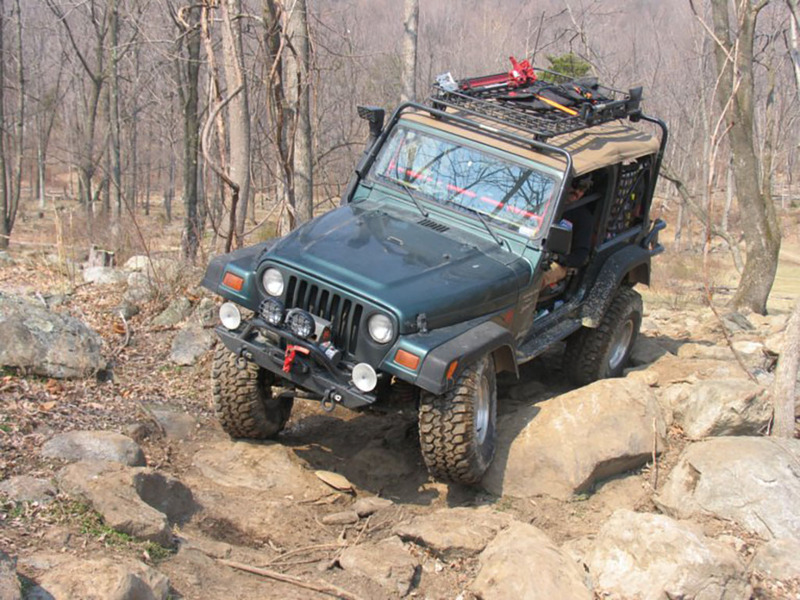 Toward the end of the day, our last obstacle was a rocky garden. It took H2 RCVRE a few tries to negotiate his way through. 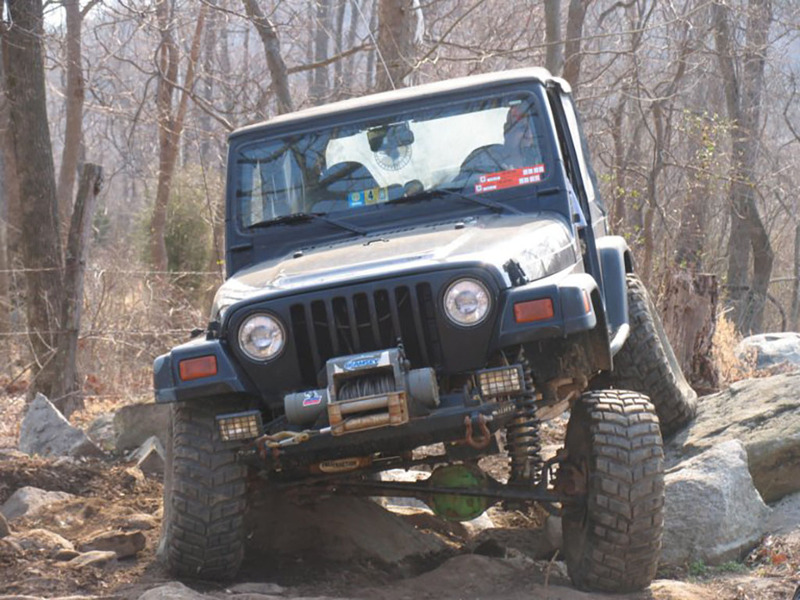 Managing front and rear tires over larger boulders at the same times presented a challenge for me, I tried about 5 times with Diego spotting me out. JC and some also made it and the rest took the by pass back to the staging area. Chad a former member of CORE was also with us today. He made a memorable impression to all of us by intentionally choosing the biggest rocks to climb and turning every moderate blue into a black challenging trail for himself. Extreme behaviors cost Chad a leaking fuel tank, bent muffler tail pipe and a rear tire popped out from its wheel. All the damages were fixed and Chad stayed with us to the end of the day. 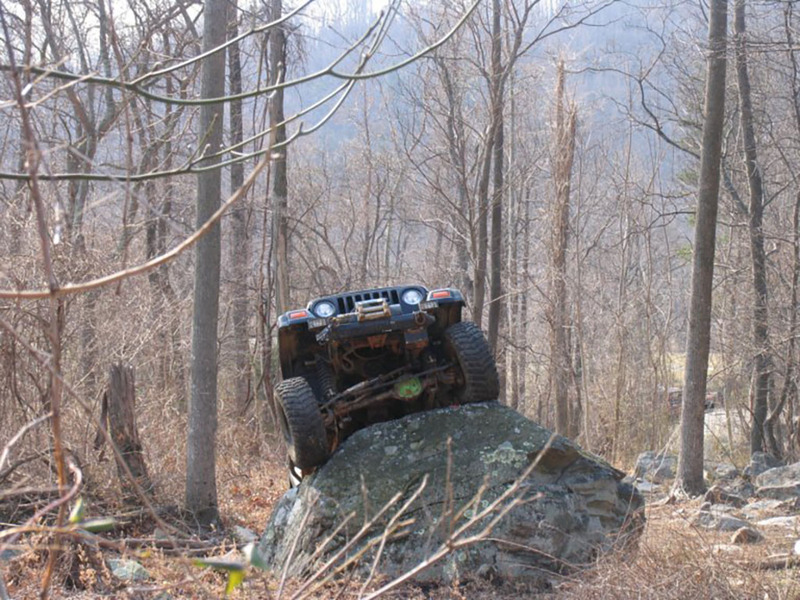 Crozet is definitely a highly challenge place to off road. 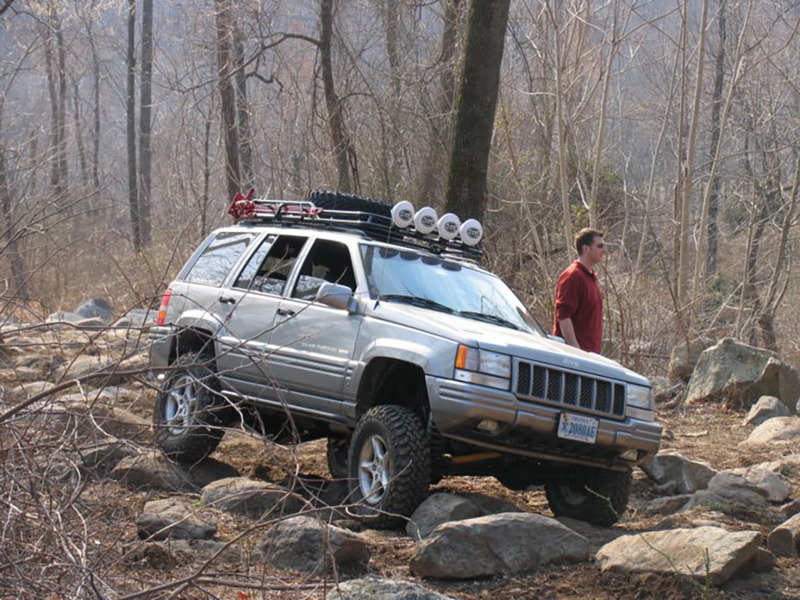 Lifted rig, bigger tires and lockers are recommended. 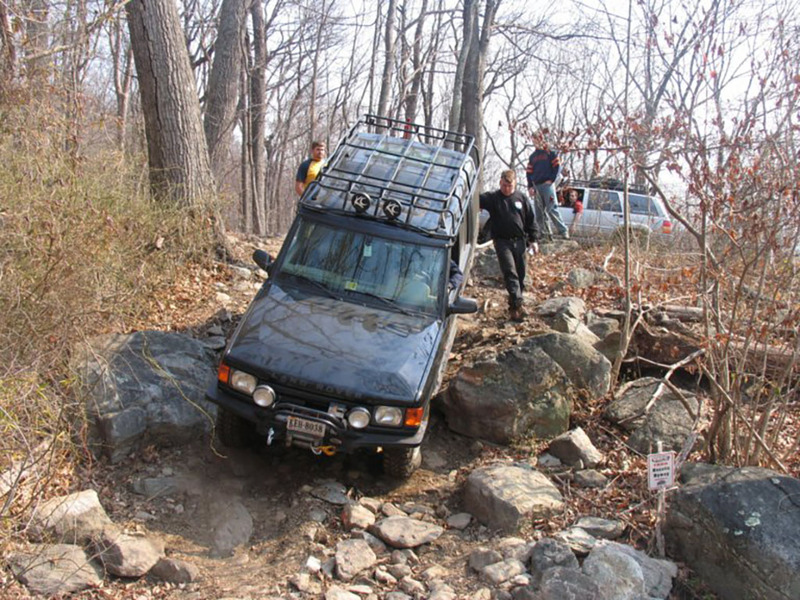 Knowing your driving capability and risk tolerance will help you to make it a 4×4 enjoyable day. 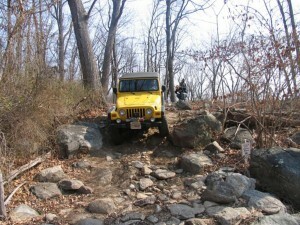 Trail report written by Loc Pham. Pictures courtesy of Loc Pham.